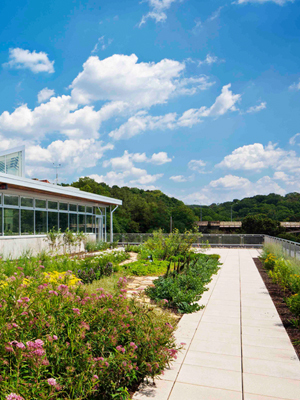 Heralded as one of the Earth’s greenest buildings, the Center for Sustainable Landscapes (CSL) is the latest addition to the Phipps Conservatory and Botanical Gardens of Pittsburgh, Pennsylvania. Housed in a Victorian-era glasshouse presented to the city by industrialist Henry Phipps in 1893, the gardens have always strived to lead the country in “green gardening.” Since transforming into a non-profit, Phipps has also been dedicated to building sustainable facilities, including the first LEED-certified visitor center in a public garden; a new tropical forest conservatory, which is the most energy efficient in the world; and the first production greenhouses to be LEED certified, achieving the highest rating of Platinum. Richard V. Piacentini, the Executive Director of Phipps Conservatory and Botanical Gardens, recently visited New York City to discuss the garden’s role in the future of sustainable architecture and living. The primary drive behind the Center for Sustainable Landscapes, as Piacentini puts it, is to function “as elegantly and efficiently as a flower.” While the merits of this approach can be questioned, the pure essentials of this poetic gesture are there. The building serves to use every drop of water that lands on its surface and is technically constructed to physically react to various elements of nature. Phipps decided to pursue all three of the highest green architecture and landscape standards: the Living Building Challenge, LEED Platinum, and Sustainable Sites Initiative™ (SITES®) 4-star certification. Meeting these standards is “extremely intense,” as Piacentini put it, but is part of the “Phipps philosophy” that he feels is necessary to retain Phipps’ reputation as stewards of the earth. 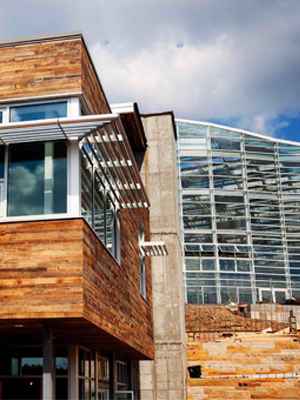 The Living Building Challenge is a philosophy, advocacy tool, and certification program that addresses development at all scales. The seven performance areas are comprised Site, Water, Energy, Health, Materials, Equity and Beauty. These goals, as well as those laid out by SITES and LEED were mainly met in conjunction with one another. The CSL is designed to interact with its surroundings as a vital part of its daily operation. 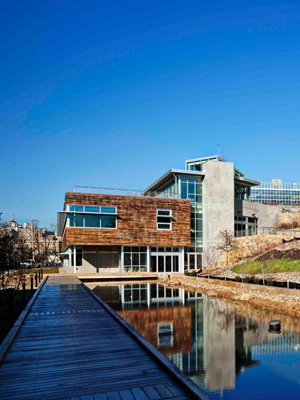 As one of the original 150 pilot projects of SITES, it features a “restorative landscape, highlighting native plants and a permaculture demonstration rooftop garden.” Other site features include a stormwater lagoon, a solar powered water distillation system, five rain gardens, porous paving and constructed wetlands that use plants and natural processes to clean wastewater. Some 14 geothermal wells, earth tubes, locally sourced material and solar orientation are just a handful of the features that make this construction so well executed. 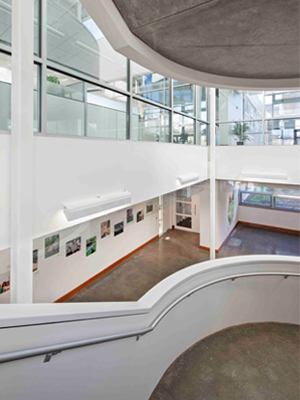 However, in obtaining points for LEED certification, Piacentini was not satisfied with simply scoring. After having discussed the virtues of the CSL, Piacentini nearly forgot to add one of his most proud achievements of the project. In line with the idea of locally sourced materials, Phipps decided that all of the labor, design, and execution would come from locally sourced talent. Phipps looked within Pennsylvania to select the lead design team. The architect, the Design Alliance, is from Pittsburgh and the landscape architect, Andropogon Associates, hails from Philadelphia. This guest post is by Tyler Silvestro, a master’s of landscape architecture candidate at the City College of New York (CUNY) and writer for The Architect’s Newspaper.